The New Directions Wrexham team have announced their ‘Temp of the Month’ for October 2016 as Marie Owen. 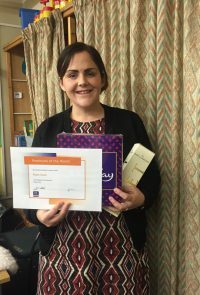 Mary Corcoran who is Marie’s Account Manager commented on the award ‘Marie has received the highest standard of feedback from every school she has been in since starting working with New Directions. Marie always goes the extra mile when she is in schools and puts her heart and soul into everything she does’. Marie was presented with her certificate whilst on assignment at Ysgol Bodhyfryd in Wrexham. Mary celebrated Marie’s achievement in her classroom.